الديم سَم أي الديمسَم ‎/‏ˈdimˈsʌm‎/‏ ((بالصينية: )Cantonese Yale(بالصينية: )) هو منهج في المطبخ الصيني (وخاصة مطبخ غوانغدونغ) يُقَدَّمُ فيه المأكولات الصغيرة بحجم لقمة الفم في سلال بخار صغيرة أو على صحون صغيرة. عادة تُقَدَّمُ مع الشاي ويشكلان معا فطور الشاي المتكامل. طبقا للتقاليد، الديمسم يُحَضَّرُ كأطباق مطبوخة بالكامل وجاهزة للتقديم. في مقاهي غوانغدونغ، عربات حافلة بالديمسم تتنقل حول المطعم كي يختار منها ويطلب الزبناء بدون النهوض من مقاعدهم. الديمسم عامة يرتبط بالعادة الأقدم وهي يمتشا ((بالصينية: )Cantonese Yale(بالصينية: )), التي أصلها في المسافرين على طريق الحرير العريق الذين احتاجوا إلى مكان للاسترخاء. إذ، أنشئت مقاهي على جانب الطريق. واكتشف أن الشاي يساعد على الهضم، فشرع أصحاب المقاهي في تقديم أنواع مختلفة من الآكل. فن طهي الديمسم تأصل مع مواطن غوانغدونغ في جنوب الصين، الذين حولوا يمتشا من مهلة استراحية إلى تجربة تعشية صاخبة وفخمة عبر القرون. في هونغ كونغ وفي معظم المدن والقرى في مقاطعة غوانغدونغ، الكثير من المطاعم تبدأ خدمة الديمسم مبكرا بحلول الساعة الخامسة صباحا. من العادات أن يجتمع المسنون ليتناولوا الديمسم بعد رياضة الصباح. ويخصص لليمتشا الكثير في جنوب الصين يوما عائليا في نهاية الأسبوع. وتقدم مطاعم الديمسم الأكثر التزاما بالتقاليد الديمسم حتى العصر، ولكن أصبح اعتياديا أن يُقَدَّمَ الديمسم وقت العشاء؛ بل وتباع أشكال الديمسم طعاما سفريا للطلاب وعمال المكاتب في التنقل. Teochew dumpling ( 潮州粉粿(بالصينية: )): Steamed dumpling with peanuts, garlic, chives, pork, dried shrimp, and Chinese mushrooms. Xiao long bao ( 小籠包(بالصينية: )): Dumplings are filled with meat or seafood and are famous for their flavor and rich broth inside. Guotie ( 鍋貼(بالصينية: )): Pan-fried dumpling, usually with meat and cabbage filling. Shaomai ( 燒賣(بالصينية: )): Steamed dumplings with pork and prawns. Usually topped off with crab roe and mushroom. Taro dumpling ( 芋角(بالصينية: )): Deep fried dumpling made with mashed taro, stuffed with diced mushrooms, shrimp and pork. Haam Seui Gok ( 鹹水角(بالصينية: )): Deep fried dumpling with pork and chopped vegetables. The wrapping is sweet and sticky, while the filling is slightly salty and savoury. Dumpling soup ( 灌湯餃(بالصينية: )): Soup with one or two big dumplings. Spring roll ( 春捲(بالصينية: )): A deep fried roll consisting of various sliced vegetables (such as carrot, cabbage, mushroom and wood ear fungus) and sometimes meat. Tofu skin roll ( 腐皮捲(بالصينية: )): A roll made of Tofu skin with various meat and sliced vegetables filling. Rice noodle roll ( 腸粉(بالصينية: )): Steamed rice noodles, rolled and filled with meats or vegetables inside but can be served plain. Popular fillings include beef, dough fritter, shrimp, and barbecued pork. Often served with a sweetened soy sauce. Barbecued pork bun ( 叉燒包(بالصينية: )): Bun with barbecued pork filling. They can either be steamed to be white and fluffy or glazed and baked to golden. The baked variant are called ( 叉燒餐包(بالصينية: )). Sweet cream buns ( 奶黃包(بالصينية: )): Steamed buns with milk custard filling. Pineapple bun ( 菠蘿包(بالصينية: )): literally means Pine apple bread. It's a pine-apple skin-like bread, usually tastes sweet. Turnip cake ( 蘿蔔糕(بالصينية: )): puddings made from shredded white radish, mixed with bits of dried shrimp, Chinese sausage and mushroom. They are steamed, then cut into slices and pan-fried. Taro cake ( 芋頭糕(بالصينية: )): puddings made of taro. Water chestnut cake ( 馬蹄糕(بالصينية: )): puddings made of crispy water chestnut. 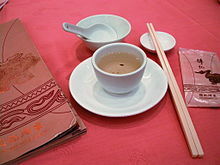 Some restaurants also serve a variation made with bamboo juice. Steamed meatball ( 牛肉丸(بالصينية: )): Steamed meatballs served on top of a thin bean-curd skin. Phoenix claws ( 鳳爪(بالصينية: )): Deep fried, boiled and then steamed chicken feet with douchi. A plain steamed version is known as "White Cloud Phoenix Claws" ( 白雲鳳爪(بالصينية: )). Spare ribs ( 排骨(بالصينية: )): Steamed pork spare ribs with douchi and sometimes garlic and chilli. Lotus leaf rice ( 糯米雞(بالصينية: )): Glutinous rice wrapped in a lotus leaf. Typically contains egg yolk, dried scallop, mushroom, and meat (usually pork and chicken). A lighter variant is known as "Pearl Chicken" ( 珍珠雞(بالصينية: )). Chinese sticky rice ( 糯米飯(بالصينية: )): Stir fried (or steamed) glutinous rice with Chinese Sausage, mushroom and spring onions. Deep fried squid ( 魷魚鬚(بالصينية: )): Similar to fried calamari, the battered squid is deep-fried. Egg tart ((بالصينية: )Cantonese Yale(بالصينية: )): Baked tart with egg custard filling. Tofu pudding ( 豆腐花(بالصينية: )): Soft tofu served with a sweet ginger or jasmine flavored syrup. Sesame ball ( 煎堆(بالصينية: )): Deep fried chewy dough with red bean paste filling, coated in sesame seeds. Thousand-layer cake ( 千層糕(بالصينية: )): A dessert made up of many layers of sweet egg dough. Malay sponge cake ( 馬拉糕(بالصينية: )): Steamed sponge cake flavoured with molasses. White sugar sponge cake:( 白糖糕(بالصينية: )): Steamed sponge cake made with white sugar. Coconut pudding ( 椰汁糕(بالصينية: )): Light and spongy but creamy puddings made with coconut milk, with a thin clear jelly layer made with coconut water on top. Mango pudding ( 芒果布甸(بالصينية: )): A sweet, rich mango-flavoured pudding usually with large chunks of fresh mango; often served with a topping of evaporated milk. شاي الأقحوان – Chrysanthemum tea does not actually contain any tea leaves. Instead it is a flower-based tisane made from chrysanthemum flowers of the species Chrysanthemum morifolium or Chrysanthemum indicum, which are most popular in East Asia. To prepare the tea, chrysanthemum flowers (usually dried) are steeped in hot water (usually 90 to 95 °م (194 to 203 °ف) after cooling from a boil) in either a teapot, cup, or glass. However, Chrysanthemum flowers are often paired with Pu-erh tea, and this is often referred to as guk pou ((بالصينية: )Cantonese Yale(بالصينية: )). الشاي الأخضر– Freshly picked leaves only go through heating and drying processes, but do not undergo oxidation. This enables the leaves to keep their original green color and retain most natural substances like polyphenols and chlorophyll contained within the leaves. This kind of tea is produced all over China and is the most popular category of tea. Representative varieties include Dragon Well ((بالصينية: )Cantonese Yale(بالصينية: )) and Biluochun from Zhejiang and Jiangsu Provinces respectively. شاي الأولونغ – The tea leaves are partially oxidized, imparting to them the characteristics of both green and black teas. Its taste is more similar to green tea than black tea, but has a less "grassy" flavor than green tea. The three major oolong-tea producing areas are on the southeast coast of China e.g. Fujian, Guangdong and Taiwan. Tieguanyin ((بالصينية: )Cantonese Yale(بالصينية: )), is one of the most popular choice of tea. It is originally cultivated in Fujian province and is a premium variety of Oolong tea with delightful fragrance. 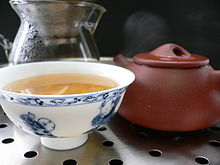 شاي بوآر المخمر (Cantonese) or Pu-erh tea (Mandarin) – The tea has undergone years of fermentation, giving them a unique earthy flavor. This variety of tea is usually compressed into different shapes like bricks, discs and bowls. الشاي المعطر – There can be various mixtures of flowers with green tea, black tea or oolong tea. Flowers used include jasmine, gardenia, magnolia, grapefruit flower, sweet-scented osmanthus and rose. There are strict rules about the proportion of flowers to tea. Jasmine tea is the most popular type of scented tea, and is often the most popular type of tea served at yum cha establishments.